Sweet potato pie is the sweetest way to get more sweet potatoes into your diet. Even if your kids say they hate sweet potatoes, they'll love these pie recipes. In fact, you don't even have to tell them that it's a sweet potato pie. The traditional pie recipes taste and look so much like pumpkin that you can likely get away with passing them off as pumpkin pies! If sweet potatoes really have the healing power that some believe they do (and I do believe), then this is a delicious way to get healthy! If you're interested, you can even learn a little about the history of these delicious pies. Sweet Potato Pie Recipe Collection! A collection of recipes from my favorite recipe books, magazines, and family recipe files. Some of us just love Southern Cooking. Here's our collection of the Southern recipes. 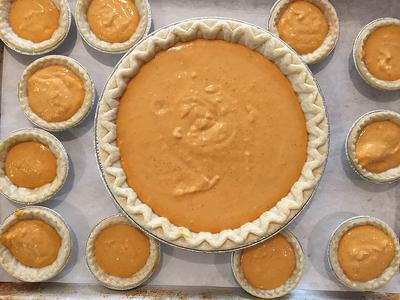 Do You Have a Favorite Sweet Potato Pie Recipe to Share? 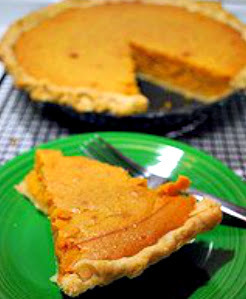 Share your Sweet Potato Pie Recipe Here! In a bowl, combine potatoes, eggs, milk, rind and nutmeg. Turn into pastry shell and sprinkle walnuts on top. Bake in a preheated oven at 375 degrees Farhenheit for 15 minutes. Reduce temperature to 325 degrees Fahrenheit and continue baking for 20 minutes. "From The Fanny Farmer Cookbook"
Long ago the sweet potato was called a "long potato" or "Virginia potato." Southern states take pride in this very American pie. Heat the oven to 425°F (220°C). Line a 9-inch pie pan with pie pastry dough. Combine the remaining ingredients in a large bowl and beat until smooth and well blended. Pour into the lined pan. Bake for 10 minutes, then reduce the heat 300°F (150°C) and bake for about 50 minutes more or until pie filling is firm. Scrub potatoes, boil with skins un­til tender, peel, mash, put through strainer. Add beaten eggs, one half of sugar, cream, melted butter, 2 tablespoons brandy. Pour into un­baked pie shell. Bake in hot oven, 450 degrees F., 10 minutes, reduce heat to 350 degrees F., bake about 35 minutes longer until knife will come out clean. When cool, cover with meringue, if desired, made of stiffly beaten whites of eggs, remaining sugar and Watkins Lemon Extract. Brown lightly in oven, serve hot. Dissolve gelatin in cold water. hot milk, pumpkin, salt and spices. Cook over boiling water stirring constantly until slightly thickened. Remove from fire, stir in dissolved gelatin. Cool. Pour into baked pie shell. Place in re­frigerator until firm, 1 to 2 hours. Serve with whipped cream and pecan meats, or serve plain. * Carrot Pie: Substitute 2 cups mashed cooked carrots for mashed sweet potatoes. 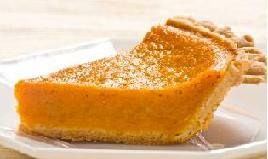 * Squash Pie: Substitute 2 cups mashed cooked winter squash for mashed sweet potatoes. Please be sure to return often, as I'll be adding more recipes over time. Reviewing the many books, magazines, and online recipe resources is time consuming. I'm just getting started! 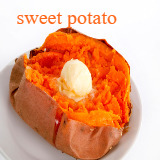 Sweet-Potato-Recipes.com's recipe listings will continuously grow with time, until we can offer you the largest collection of sweet potato recipes available! These sweet potato muffins may turn out to be your favorite. It's one of our lower sugar and fat versions. We offer a variety of sweet potato muffin recipes and sweet potato bread recipes. Sweet Potato Biscuit Recipe. Not your everyday biscuit here. It's packed full of the super food nutrients of the sweet potato. A great way to get sweet potatoes into your family's diet. Tastes no different than pumpkin pie. Yummy!